It was a nice sunny day for Christmas. We went to the family rental home at Kehad Fa in Cha-am to start off the shoot. The family also celebrated the grandmother's birthday on that day. Everyone was happy and cheerful. 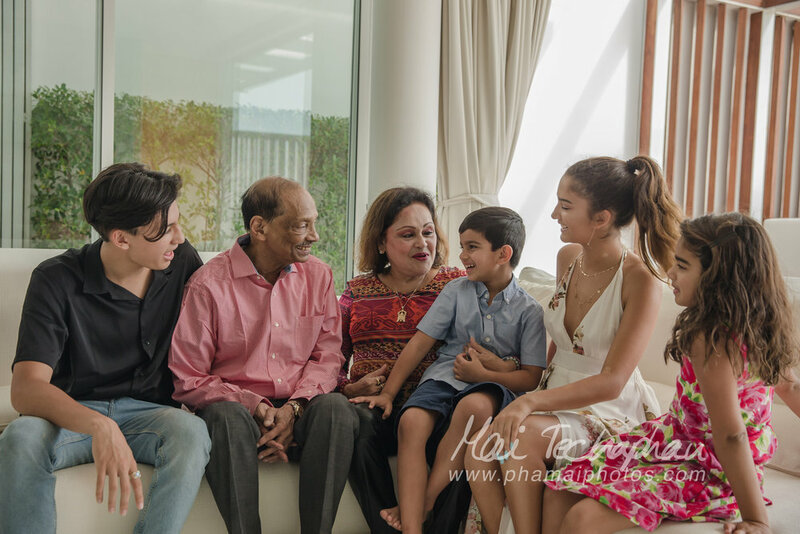 After we spent about 1 hour taking photos at the rental home, we moved the location to Hua Hin Marriott Resort & Spa where the family will be having Christmas lunch buffet. We were quite familiar with the hotel as we have had a few photo sessions with clients there before. The garden is big and nice which is great when we have a session with small children so that can run around and play with their parents. We also love the bridges around the hotel because they are very nicely decorated with colorful flowers and trees. We didn't do the photos on the beach for the session as we were running out of time and the family would like to go celebrate the birthday at the restaurant.